Corn tortillas provide the basis for many Mexican or Mexican-inspired dishes. These pieces of bread made from corn and lime are hard and unappetizing straight out of the bag. Softening them requires some type of frying method. The unhealthy way to fry tortillas is to submerge them in a pan filled with a not-so-healthy oil, such as vegetable oil or even less healthy animal fat. Olive oil, a heart-healthy fat source, works just as well, and it takes only a little to soften the tortillas. Put a small skillet on a stove top burner set on medium to high heat. Pour 2 tbsp. of olive oil into the skillet. Heat the oil until a drop of water pops when you place it in the oil. Place two tortillas at a time into the hot oil, and fry them for 30 seconds..
Flip the tortilla stack over with a pair of tongs, and fry the tortillas for another 30 seconds. Flip the top tortilla over while the bottom tortilla is frying. Flip the stack again and fry them for another 30 seconds. Fry the tortillas just until they puff and soften, but do not let them become hard or crisp. 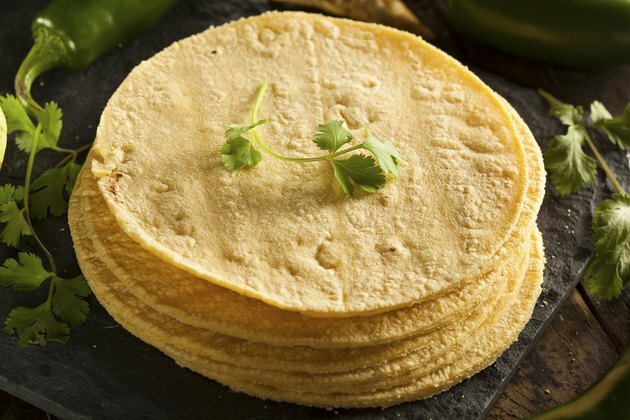 Lay the tortillas on a paper towel to absorb excess oil. Repeat frying the other tortillas, following the same procedure. Add more oil to the pan as necessary if the oil starts to dissipate. Serve corn tortillas immediately, or place them in a warm oven to keep them warm.